VA Sec. Shinseki Resigns, But is This Just a Band-Aid on a Broken VA Hospital System … Who Will Be Fired or Prosecuted for Fraud & Murder ? 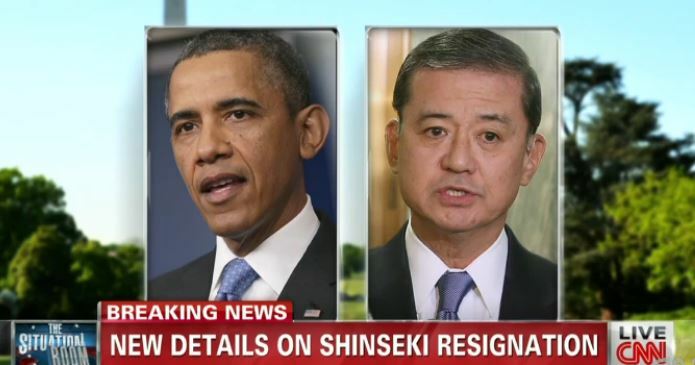 Friday morning, following comments from VA Secretary Eric Shinseki regarding the current VA scandal, Shinseki met with Barack Obama where he gave his resignation. Barack Obama accepted it and in comments to the press stated that Shinseki did not want to be a distraction because his priority is to fix the problem and make sure our vets are getting the care that they need. Obama said that was Ric’s judgment on behalf of his fellow veterans and he I agreed, we don’t have time for distractions. We need to fix the problem. REALLY? Obama said Sloan D. Gibson, the deputy secretary of veterans affairs, will take over the VA until a new secretary is named. Great, some one from within the same system. Having one individual resign and throwing more money at the problem is not the answer. The VA problems are systemic and the people at the top claimed they had no idea what was going on and that they were lied to. IT’S TIME TO PURGE!!! Some people need to be fired and others who took an active role in the fraud perpetrated on our military veterans and ‘We the People” that caused the deaths of many of America’s heroes need to be prosecuted and jailed. So Ric’s commitment to our veterans is unquestioned. His service to our country is exemplary. I am grateful for his service, as are many veterans across the country. He has worked hard to investigate and identify the problems with access to care. But as he told me this morning, the V.A. needs new leadership to address them. He does not want to be a distraction because his priority is to fix the problem and make sure our vets are getting the care that they need. That was Ric’s judgment on behalf of his fellow veterans. And I agree. We don’t have time for distractions. We need to fix the problem. For now, the leader that will help move us forward is Sloan Gibson, who will take on the reins as acting secretary. The boss resigned under pressure and other Veterans Affairs managers are likely on the way out. Now the challenge is to solve the problem by providing timely health care for hundreds — perhaps thousands — of waiting veterans around the country. Obama went before reporters months after CNN broke the story about the latest problems at the VA and minutes after meeting Shinseki at the White House. Sorry America … take a good look at what you can expect with Obamacare and what Barack Obama and Democrats most want, a single payer healthcare system. VA SCANDAL … It is as bad as first thought and this is only the tip of the iceberg of a systemic issue throughout the Veterans Administration. The WAPO is reporting that the allegations against the VA have been substantiated by a recent independent report from the Department of Veterans Affairs inspector general’s office. The report focused mainly on the Phoenix clinic, where recent allegations of records manipulation came to public knowledge and scrutiny. However, the problem is not just in Phoenix, it is every where. The inappropriate scheduling practices are systemic throughout the Veterans Health Administration. Even with bi-partisan calls for VA Secretary Eric Shinseki to resign, he has not done so yet. However, this is only a matter of time. First thought weeks and then maybe days, the VA scandal has become so bad and wide-spread, that calls from all sides that it may be hours. However, the problem is not just Shinseki and is not the only one that needs to go. There are many within the VA who probably needs to be tried criminally. No one does not think that Gen. Shinseki is not a patriot and we thank him for his tremendous military service to the United States; however, that does not make him a concomitant administrator and for that he needs to be replaced. However Barack Obama continues to stand behind Shinseki as no one in the Obama Administration is ever held accountable for scandals and incompetence. An independent report from the Department of Veterans Affairs inspector general’s office substantiates recent allegations that VA health clinics used inappropriate scheduling practices that concealed treatment delays — lasting an average of 115 days in a sampling of patients — and boosted performance measures that help determine whether bonuses are deserved. Official VA data showed that 226 patients in a sampling from the Phoenix clinic had waited just 24 days on average for their first primary care appointments. But the inspector general’s office determined that those veterans had actually waited an average of 115 days. The unofficial wait lists may represent the “secret” list that whistleblowers claim the Phoenix clinic used to cover up treatment delays, according to the report. 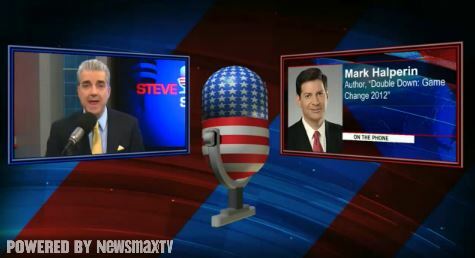 Mark Halperin says the following on “The Steve Malzberg Show” on Newsmax TV, “It’s built into the plan. It’s not like a guess or like a judgment. That’s going to be part of how costs are controlled”. More at TPM, one of the Beltway’s best-known pundits gave credence this week to perhaps the fringiest of all Obamacare conspiracy theories … death panels. But is it really a conspiracy theory? Didn’t Barack Obama also tell us that if you liked your healthcare plan, you could keep your healthcare plan, PERIOD! 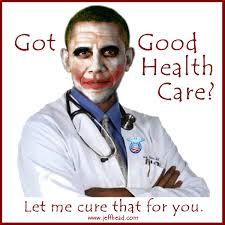 Didn’t Obama tell us we could keep our doctor and hospital as well? Didn’t Obama promise us that premiums would go down? ALL WERE LIES THAT OBAMA KNEW WERE LIES!!! So what would make anyone think now that the “death” panels, i.e. end of life healthcare rationing were not true as well? Barack Obama hardly has a track record of telling the truth. What was Obama and his minions going to do in getting this bogus law passed and prior to the 2012 presidential, tell the truth that bureaucrats would kill off grandma as they waged a war on the GOP that Republicans wanted to push her off the cliff? Hardly. Obamacare was passed on the intentional deceit of the White House and all that dare get in its way are say anything bad were attacked. How’s that “Hopey-Changey” death panels working out for you America? “We do need to do some of that in this country, because we can’t afford to spend so much on end-of-life care. A very high percentage of our healthcare spending is for a very small number of people at the last stages of their life,” he said Monday. HALPERIN: No, I agree, and that’s going to be a huge issue, and that’s something else on which the president was not fully forthcoming and straightforward. MALZBERG: So, you believe there will be rationing, a.k.a. death panels? HALPERIN: It’s built into the plan. It’s not like a guess or like a judgment. That’s going to be part of how costs are controlled. 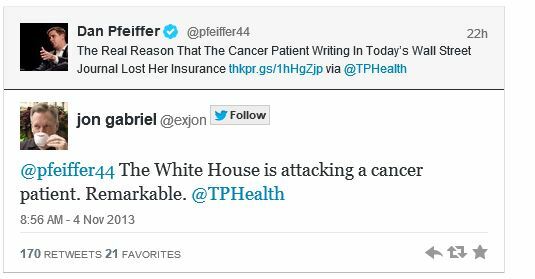 Remember when Sarah Palin said there were death panels in Obamacare 4 years ago and was vilified? Now suddenly Democrats are admitting that Sarah Palin was right. Oh how that must pain liberals and Democrats. Suddenly 22 Dems and counting are agreeing with Sarahcuda. Think about that America, the woman that Democrats love to hate was right on “DEATH PANELS”. Just curious, is ‘Palin Derangement Syndrome (PDS), covered under Obamacare? Add Edie Littlefield Sunby to the list of losers of Obamacare … Barack Obama knowingly lied and people will die. Really, you might want to read the tragic and heart-breaking story of Edie Littlefield Sunby, a state-4 gallbladder cancer patient who has become a victim of Obamacare and the lies that were spewed to pass the failed law. As reported in the Wall Street Journal, thanks to Obamacare Edie Littlefield Sunby will lose her healthcare insurance and her doctors. Lies have consequences, especially when Obama and Democrats knew that millions would lose their insurance because of Obamacare. Thanks Democrats as you own this one 100% as the not-so affordable care act was passed with not one GOP vote. Yup, no death panels here, eh? WAKE UP AMERICA … Obamacare has never been about healthcare, it is about controlling your lives from birth to death. 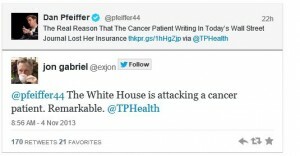 UPDATE I … TWITCHY: Despicable, White House smears stage 4 cancer survivor who lost her insurance plan due to Obamacare. This White House has no conscience. A smear campaign against a cancer patient in order to protect the diasaster that is Obamacare where Obama and Democrats knowingly lied to the American people that they could keep their healthcare insurance if they liked it, PERIOD! Sick, just frigging sick!